Codementor Support - How do mentors request a freelance job from users? All Categories ​>​ I&apos;m a Mentor ​>​ Work on a Freelance Job for a Client ​>​ How do mentors request a freelance job from users? 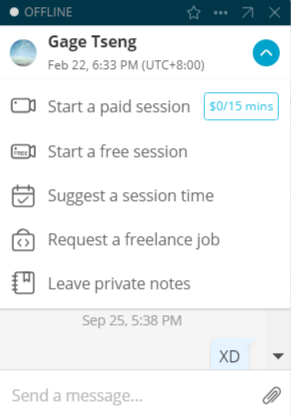 To request a freelance job from a user, mentors can click on the "Request a freelance job" button through the chat window. If mentors plan to help a user outside of a live session, we highly recommend mentors ask the user to create a freelance job and put the payment in escrow with us. Please contact us if you need any further assistance.